Ireland’s south coast is a stellar destination for the adventurous traveler seeking innovative cuisine, contemporary art and a buzzing nightlife. One of Ireland’s most visited counties, Cork is a good place to visit and a cultural hub in it's own right. Here, visitors will find a flourishing culinary scene with markets selling local artisanal fare, an annual gourmet festival and the best-known seafood restaurant in the country. Nightlife in Cork City caters to any mood, ranging from some of the most engaging pubs in the country to burlesque and jazz. And just beyond, through the picturesque countryside and charming harbor villages, are plenty of water sports, from wind-surfing and sailing to deep-sea angling. The arts scene in Cork city is thriving—there's a constant stream of exhibitions, concerts and events. A diverse program of theater, dance and music is held in the beautiful Victorian Everyman Palace (MacCurtain Street, 021-450-1673, everymanpalace.com), while the Cork Arts Theatre (Camden Court, Carroll's Quay, 021-450-5624, corkartstheatre.com) runs smaller-scale performances supporting emerging playwrights. Housed in a handsome red-brick 18th-century building, once the city’s Custom House, is the excellent Crawford Art Gallery (Emmet Place, 021-480-5042, crawfordartgallery.ie). The main collection contains more than 2,000 pieces, and is particularly strong in 19th- and early 20th-century Irish art. Artists featured include Jack B. Yeats, Joan Miró and Picasso. A modern extension displays temporary shows of Irish and European contemporary art. You could easily pass several hours touring the galleries, followed by lunch in the excellent café. In the west of the city, at the entrance to the University, the Glucksman Gallery (021-490-1844, glucksman.org, closed Mon) is housed in one of Cork's most interesting contemporary buildings, a wooden, glass, limestone and steel construction. 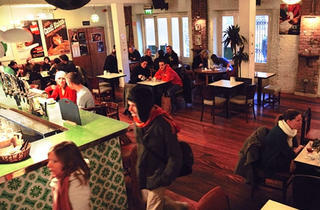 As well as a number of modern art exhibitions throughout the year, there's also a lovely café on the premises. Cork has many festivals: In June, the atmosphere is electric for the Cork Midsummer Festival (corkmidsummer.com), two weeks of music, dance, theater, visual arts and street entertainment in venues throughout the city. At the end of October, the Cork Jazz Festival (guinnessjazzfestival.com) draws thousands of jazz lovers from around the world to see national and international musicians perform. Other events of note include the Irish International Folk Dance Festival (damhsafest.ie, July); the Cork Folk Festival (corkfolkfestival.com, late September/early October); the East Coast Early Music Festival (eastcorkearlymusic.ie, October); and the Cork Film Festival (corkfilmfest.org, November). 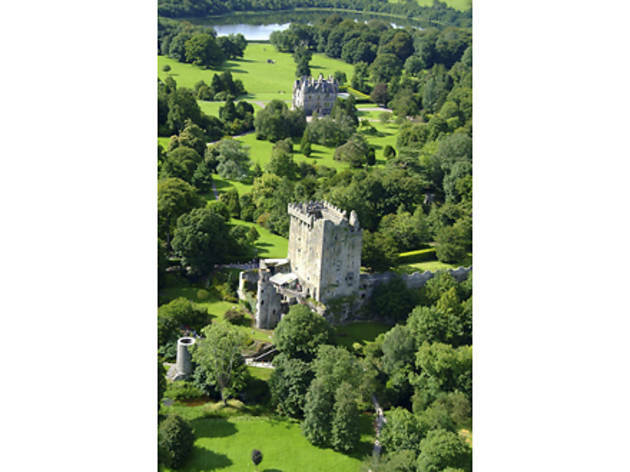 One of the most legendary sights in Ireland, Blarney Castle (021-438-5252, blarneycastle.ie; open May Mon–Sat 9am–6:30pm; June-Aug Mon–Sat 9am–7pm; Sept Mon–Sat 9am–6:30pm; Oct-Apr Mon–Sat 9am to 5:30pm/sundown; call for seasonal Sunday hours. Admission €12; €5–€10 reductions) is just five miles north of Cork city. It is in the castle's battlements that a block of bluestone, famously known as the Blarney Stone, is embedded and said to give those who kiss the stone the gift of eloquence. Laying lips to stone is a tricky business, though, as to do so one must lie down and extend his or her head backwards over the parapet's edge. Surely taking in the history of the castle will aid your courage: This is the third stronghold built on the site; erected in 1446, it replaced two that had come before, the first built in the 10th century. Oliver Plunkett Street, Cork City; corkenglishmarket.ie. 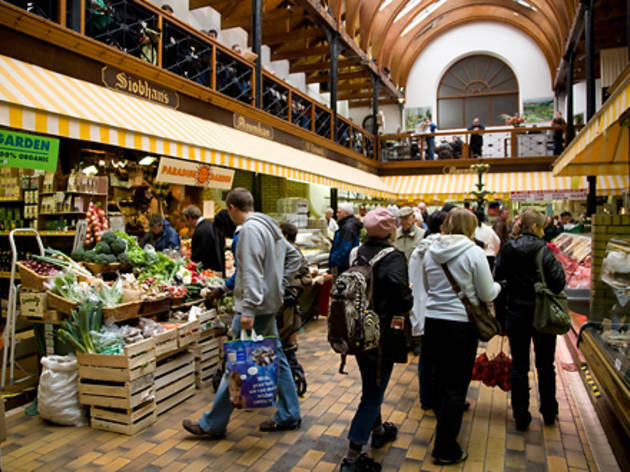 Open 9am–5pm Mon–Sat), Cork’s huge covered food market is widely regarded as one of the best food markets in Europe and epitomizes the very essence of Cork’s thriving culinary scene: fresh, vibrant, innovative and organic. It was established in 1788 as a simple fruit and vegetable market. Nowadays, alongside traditional stalls selling local meat and fresh fish, you’ll find artisan food producers offering handmade chocolates, specialty cheeses, gourmet sausages, fancy olives and organic vegetables. Carnivores should check out Kathleen Noonan’s pig meat stall, which sells traditional favorites such as pigs’ tails and crubbeens (pigs’ feet). Others might prefer the unusual loaves of the Alternative Bread Company or Ballycotton Seafood’s amazing array of fish. Foodies, beware: You may never want to leave. 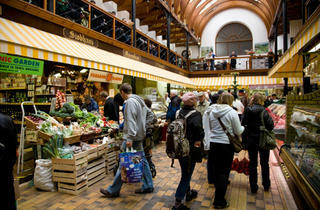 Cork has a host of specialist food shops, and a vibrant dining scene. The narrow streets on the island are full of attractive options: Amicus (Paul Street, 021-427-6455, www.amicusrestaurant.ie) serves a range of international dishes in a bright and contemporary dining room. In the English Market is the atmospheric Farmgate Café (021-427-8134, www.farmgate.ie), which creates moreish, wholesome dishes using the best of the market's ingredients. Café Gusto (3 Washington Street, 021-425-4446, cafegusto.com; closed Sun) is good for meze plates and antipasti platters, and also has a BYO policy. Along the quays are Club Brasserie (Lapps Quay, 021-427-3987, closed Sun), a contemporary restaurant equally good for lunch or dinner, while the Boardwalk Bar & Grill (Lapps Quay, 021-427-9990, theboardwalkbarandgrill.com, closed Sun) serves great steak. 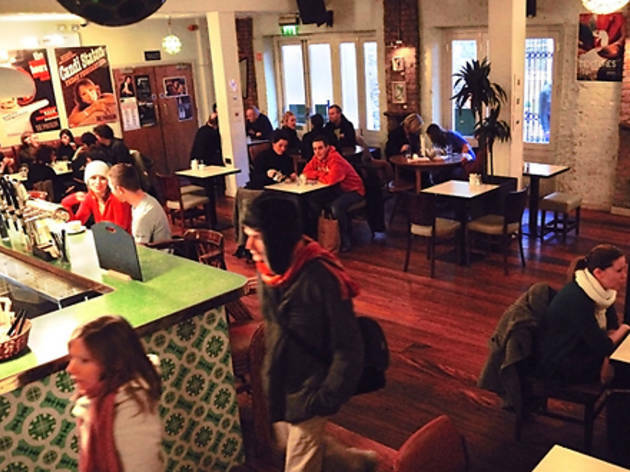 Cork City boasts some of the Ireland’s most engaging pubs and clubs. Tucked down an alleyway off St. Patrick’s Street, Mutton Lane (Mutton Lane; 021-427-3471) is an intimate, traditional bar. It offers oodles of character and plenty of candlelight, making it a cozy place for a drink or two. The Crane Lane Theatre (Phoenix Street; 021-427-8487, cranelanetheatre.ie), located in a converted old gentlemen's club, styles itself as “a house of jazz, blues and burlesque.” It has three bars, there’s always some form of musical event happening, and they serve till late. On nearby St. Patrick's Street, the Savoy (021-427-4299, savoyclubandvenue.com) has club nights several nights a week and live gigs on Fridays. If you’re looking for something a little different, try the quirky Hi-B Bar (Oliver Plunkett Street; 021-427-2758; no credit cards), a Cork institution. Walk up a narrow, creaking staircase to enter the tiny room, usually buzzing with a mixed crowd. Down a cobbled lane in the old French Quarter, the Pavilion (Carey’s Lane, 021-427-6230, pavilioncork.com) has a popular bar downstairs (with frequent musicians and DJs), while upstairs in the old cinema room, there are concerts and other events. At weekends, it operates as a nightclub. And, if you’re seeking a small piece of classic Ireland, Sin é (Coburg Street, 021-450-2266) is a busy bar with traditional music most weekend nights. Cork City isn't the only place in Cork county that has emerged as a culinary destination. About 12 miles east and north of Cork City you'll find the market town of Midleton, which is a culinary hub in its own right. There is a wonderful farmer's market on Hospital Road on Saturday mornings, and the Midleton Food & Drink Festival (midletonfoodfestival.ie) in September sees the town packed with food stalls. Midleton is also where the Jameson whiskey empire began, more than 200 years ago. Whiskey is no longer distilled on the site (Old Distillery Walk, 021-461-3594, tours.jamesonwhiskey.com), but you can take a guided tour of the old distillery, visiting the mills, maltings, warehouses and kilns, and finishing with a tipple of the good stuff. Just south of Midleton in Shanagarry is Ballymaloe House hotel (021-465-2531, ballymaloe.com), which boasts a splendid restaurant and, two miles away, an internationally renowned cooking school. The heart of Ballymaloe is the rambling house set on 400 acres, most of which is farmed—much of the farm’s produce is used in the café and restaurant. Within the main house, lunch and dinner are served in elegant, interconnecting dining rooms. The evening menu is five courses (with plenty of choice), and might start with soup, followed by Ballymaloe pork, spinach and herb terrine, a main such as grilled Ballycotton hake with crab, tomato and ginger beurre blanc and zucchini, and then Irish cheeses and dessert. There’s also a café behind the house, and a crafts and food shop. Accommodations consist of 30 prettily decorated bedrooms (€170–€250 double incl. breakfast), and some attractive self-catering cottages and chalets. A half-hour drive south of Cork City, at the mouth of the River Bandon, sits Kinsale, which has emerged as the gourmet capital of the county. With green headlands stretching either side, Kinsale’s colorful buildings and stunning waterside location have made it one of the best-loved towns in Ireland. Its maze of narrow streets are tightly packed with brightly painted buildings housing art galleries, boutiques, bars, restaurants and cafés. 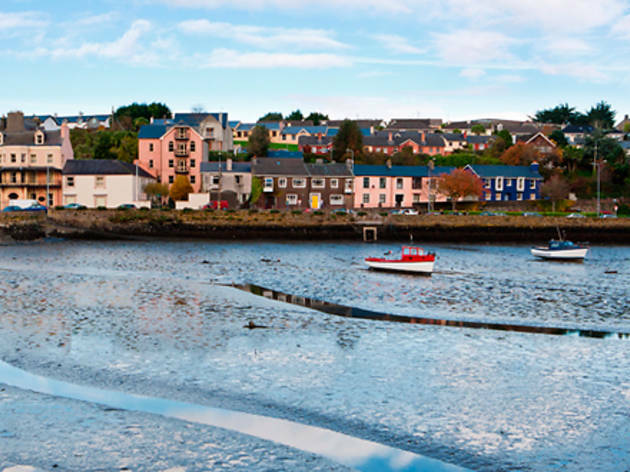 Not only is Kinsale one of Ireland’s most beautiful towns, it’s also a gourmand destination. Festivals pull in the crowds too: in October, there’s a Gourmet Festival and a Jazz Festival (for both, see kinsale.ie), and a weeklong arts festival (kinsaleartsweek.com) in July. 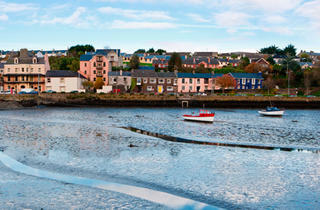 Among Kinsale's most-noted attractions is Fishy Fishy restaurant (Pier Road, 021-470-0415, fishyfishy.ie). Casual and relaxed, the seafood restaurant is known across the country. A small bar area leads into a bright restaurant, where pieces of fish-shaped metal, artworks and photographs of local fishermen leave diners in no doubt about the content of the menu. Choose your lobster from the tank, or opt for the catch of the day. The food is classic stuff: seafood chowder, fish pie and so on. There’s a buzzy atmosphere, friendly service and a covetable outdoor seating area. Fishy Fishy also runs a fish-and-chip shop in the center of Kinsale (open noon–4:30pm Tue–Sat).